Crimson-crested woodpecker, Spangled cotinga, Lemon-throated barbet, White-eared jacamar, Black-capped donacobius... it wouldn't be enough space here to mention all the birds you can see in this Paradaise. Pacaya Samiria is almost a new spot. 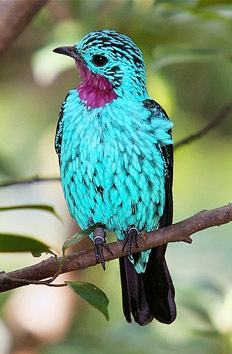 Be ready to discover some more birds. Reception at the International Lima Airport "Jorge Chavez"
Transfer to the Hotel and American Breakfast. DAY 1 Flight Lima-Iquitos. Transfer to the Lodge. DAY 2 Islands of the River. DAYS 4, 5 y 6 Yanira - Pacaya Samiria National Reserve. Transfer to Jorge Chavez airport, fly to Iquitos. Transfer to Lodge. The travel lasts 3.5 hours. 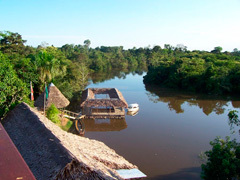 We will observe the confluence of the Marañon and Ucayali rivers, head of the Amazon River. 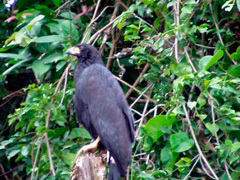 During the trip, we will observe herons, birds of prey and riverine birds. chance to see the Black skimmer. Reception at the lodge. Lunch. n the afternoon, we will go to an observation structure, an ideal place to observe birds in the forest canopy, like the Paradise Tanager, Hooded tanager, Opal-crowned tanager, Masked crimson tanager, Plum-throated cotinga, various species of flycatchers, parrots, like the Canary-winged parakeet and Short-tailed parrot and, luckily, macaws. Dinner and briefing about the activities of the next day. Night at the lodge. DAY 02: LODGE - RIVER ISLANDS. Jungle wild dawn. Birdwatching. Walk along primary rainforest trails that surround the lodge (terra firme) to observe understory birds, like the Blue-crowned, Wire- tailed and Golden-headed manakin, trogons, like the Black-throated trogon, y various species of antbirds like the White-flanked antwren, Spot-winged antshrike and the rare Black-crested antshrike. Lunch. 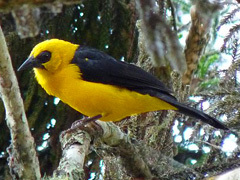 In the afternoon, we will concentrate us in river island birds, like the White-headed marsh tyrant, Lesser-wagtail tyrant, Castelnau's antshrike, Parker's and White-bellied spinetail, Lesser horneros, Oriole blackbird, Little woodpecker, among others. Return to the lodge. Dinner an briefing about the activities of the next day. Night at the lodge. DAY 03: NAUTA CREEK - LODGE. Early morning breakfast. Departure to the Pacaya Samiria National Reserve. Boat excursion to nauta creek and the surrounding lakes, an area rich in birds. Chance to observe different kind of kingfishers, like the Amazon, ringed, Green and Rufous kingfisher and the spectacular American pygmy kingfisher. Also, Wattled jacanas and Anhingas. 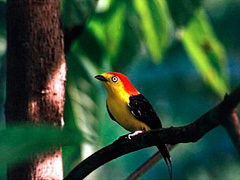 In the surrounding forest, we will observe mixed flocks of Tanagers and Chesnut-eared aracari, Crimson-crested woodpecker, Spangled cotinga, Lemon-throated barbet, White-eared jacamar, Black-capped donacobius, among others. Return to the lodge. LUNCH. In the afternoon, while we are seaching for birds, we will the lodge. Dinner an briefing about the activities of the next day. Night at the lodge. 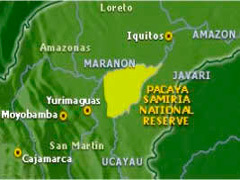 YARINA RIVER - NATIONAL RESERVE OF PACAYA SAMIRIA. Yarina River During these days, we will explore the Yanayacu River area, in the psnr. 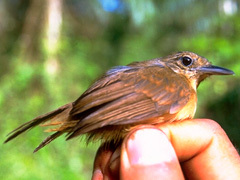 Activities consist of treks in terra firme, varzea and flooded forest, night excursions in search of nocturnal birds and also boat excursions to lakes and creeks. These area has been recently opened to tourism so the fauna and flora is more abundant than in other areas. Accomodation is in tents, in river beaches or in the forest. chance to observe gray and pink dolphins, different species of primates, river turttles, sloths, etc. 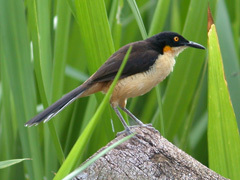 In relation to birds, we will observe the Horned screamer, Black-collared hawk, Jabiru storks, Woodstorks, Roseate spoonbill, Pied lapwig, Lesser and greater yellowlegs, Yellow-billed tern, Blue and yellow macaws, Scarlet macaws. 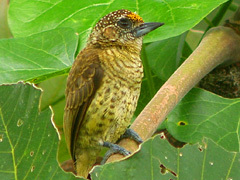 In the forest, we will try to find the endemic Black-tailed antbird, Black-necked and Red cotinga, gray-cheeked nunlet, lettered and Ivory-billed aracaris, Bar-breasted piculet, Black bushbird, Rufous-capped antthrush, Tropical gnatcatcher, Yellow-billed jacamar, among others. On the afternoon of day 6, we will return to the lodge. DAY 07 LODGE - IQUITOS - LIMA. Free morning to relax or birdwatching in the lodge area. Lunch. Return to the city of Iquitos. Transfer to airport. Return to Lima. Transfer to the Hotel.